The 2016 general election campaign is likely to cost the two major-party nominees upwards of a billion dollars each. 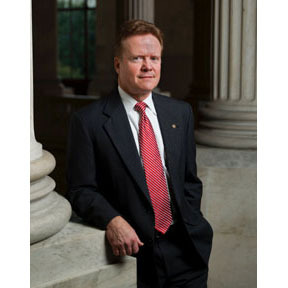 Jim Webb is among those who thinks this isn’t a good sign for American democracy. “I am unbought and unbossed,” Webb said in his turn in the Iowa State Fair political soapbox this week, decrying the importance placed on money. Webb, the former Virginia U.S. senator, is among five candidates vying for the Democratic Party presidential nomination. By far a long shot, Webb touted his military credentials, as a Vietnam veteran and former Secretary of the Navy in the Reagan administration. Speaking of Reagan, he did the Republican thing and gave the 40th president a shout-out, calling Reagan one of his favorite historical presidents, along with FDR. Doubling down, Webb talked up his support of the proposed Keystone pipeline, which he said would create jobs and help the U.S. become more energy-independent. “In terms of environmental analysis, it’s neutral. On balance, I think it’s good,” Webb said.